I was privileged to visit St Wenzel�s Church in Naumburg in June 2001 with the postgraduate organ class of the Toulouse Conservatoire. The church houses the important 1740s organ by Zacharias Hildebrandt, a sizeable three manual instrument which Johann Sebastian Bach knew and played. The organ was most recently restored by the firm of Eule in the late 1990s, and organists have flooded to play it since its re-inauguration in 2000. The Plenum may not be the most authentic for playing Bach, but it is certainly thrilling to play and listen to. 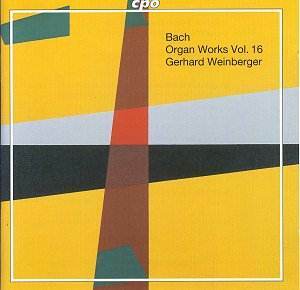 Gerhard Weinberger has chosen a varied programme of works for this his 16th disc of Bach�s solo organ works. The programme opens with a bold performance of the Pi�ce d�Orgue (8 foot plenum for the opening, 16 foot for the centre, with 32 reed added for the end). Two Trios are included: In no. 3 I didn�t particularly like the registrations, especially with regard to balance (for example the third movement 842 against Principal 8 and Flute 4). The bright colours for the Sixth Sonata are more suitable for the style of this piece, which is given a lively reading. The other substantial item is the Canonic Variations in the BWV 769a version. Again Weinberger chooses bold and varied colours and I especially enjoyed the central variation which builds-up to a powerful climax. The Praeludium et Fuga in A has interesting rhythmic interest, although again I found the opening registration (8 and 2) a little anachronistic. The Fuga in g BWV 542 (without the Fantasia) and the chorale Jesus, meine Zuversicht complete a well-constructed programme that one might expect to hear as a full concert performance. The CD booklet contains details of the music, instrument and performer in three languages and a full specification as well as registrations. Weinberger achieves well paced performances - this is worth adding to your collection.